The purpose of the S-55 series were to test vehicle performance and guidance and to investigate the nature and effects of micrometeoroids on the spacecraft systems. The cylindrically shaped spacecraft, about 61 cm in diameter and 192 cm long, was built around the burned-out fourth stage of the Scout launch vehicle that remained as part of the orbiting satellite. They carried stainless steel pressurized-cell penetration detectors, impact detectors, capacitor detectors, and cadmium sulfide cell detectors to obtain data on the size, number, distribution, and momentum of dust particles in the near-earth environment. S-55, also known as Meteoroid Sat A, was launched using a Scout-X1 rocket from the Wallops Flight Facility. Its mission was to evaluate the launch vehicle, and investigate micrometeoroid impact and penetration. The mission failed because the third stage failed to ignite and the spacecraft did not achieve orbit. S 55a or Explorer 13 was injected into a geocentric orbit of moderate eccentricity using a Scout-X1 launch vehicle. The objectives of the flight were to test vehicle performance and guidance and to investigate the nature and effects of micrometeoroids on the spacecraft systems. The scientific instrumentation consisted of cadium sulfide-cell, wire-grid, piezoelectric, pressurized-cell, and foil-type micrometeoroid detectors. The orbit was lower than planned, and the spacecraft reentered the atmosphere on 28 August 1961, after only slightly more than 2 days in orbit. No penetrations were recorded by this satellite during experiment operations. This aided in determination of useful flux limits for subsequent experiment design. 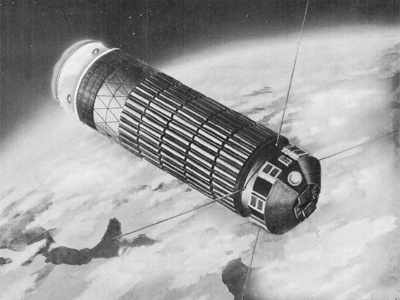 S 55b, also known as Explorer 16, was the second in the series of micrometeoroid satellites orbited by NASA. Its purpose was to obtain data on the near-earth meteoroid environment, thus providing an accurate estimate of the probability of penetration in spacecraft structures by meteoroids and allowing a more confident definition of the relationship between penetration flux and material thickness to be derived. The cylindrically shaped spacecraft, about 61 cm in diameter and 192-cm long, was built around the burned-out fourth stage of the Scout launch vehicle that remained as part of the orbiting satellite. Explorer 16 carried stainless steel pressurized-cell penetration detectors, impact detectors, capacitor detectors, and cadmium sulfide cell detectors to obtain data on the size, number, distribution, and momentum of dust particles in the near-earth environment. The spacecraft operated satisfactorily during its 7-month life (16 December 1962, to July 1963), and all mission objectives were accomplished. The fourth satellite in this series, Explorer 23 or S 55c featured a modified design.